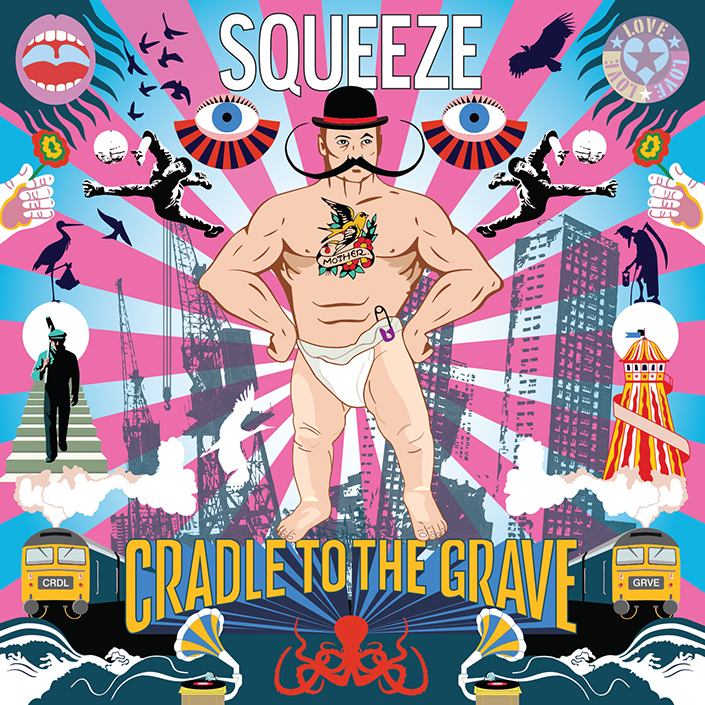 The first album of new Squeeze songs in over 20 years is finally here! Cradle To The Grave will be officially released alongside the screening of the TV series of the same title in October 2015 – but we are making available a Fan Only Limited Edition CD Mintpack of strictly 1000 copies, all individually numbered, with a one time collector’s insert – a replica of the train ticket that appers on the tour artwork, numbered from 1-1000, pictured below. We are taking pre-orders for the CD, which will be available to ship from approximately August 24th. As if that wasn’t enough, the album includes new song “Happy Days” which is now receiving great airplay on Radio 2, as well as a few songs that will be familiar from the demo stage where they were available on the true to it’s word “Arse About Face” CD. A limited edition numbered version? Count me in. 11 Responses to "“Cradle To The Grave” LTD EDITION CD AVAILABLE TO ORDER NOW"
Fantastic news – though I have to ask, “seventeen years after their last single”? Does the wonderful Tommy not count then?? Will PO3 keep a log of which number is whose? Perhaps you’d like to do that for us Mark?! Got mine today. Do Not Disturb! The old magic is all there – the melodic tunes, the evocative, honest lyrics, the classic Squeeze vocal combination, Glenn and Chris singing an octave apart, the quirky instrumentation – and instantly you’re spellbound by this wonderful collection of songs. Chris and Glenn have assembled a classic Squeeze line-up here. Okay so John Bentley (round of applause please) is gone, but Fluffer Lucy Shaw is such a great replacement (bass duties are divided more or less equally between them) and clearly this band, with fellow-Fluffers Simon Hanson on drums and Stephen Large on keyboards, are capable of playing anything. So many different genres are in the mix and not once does one feel they’ve over-reached themselves. The stonking title track, already a live favourite having been around for a couple of years, kicks things off with a ukulele and then rocks out irresistibly. Nirvana has a happy seventies soul vibe (and a sitar!) that belies it’s poignant subject matter of parents, after their kids have gone, left with nothing but each other and finding that it’s not up to much. The Beautiful Game has a typically quirky Squeeze touch – a mini moog picking out the counter-melody. The single Happy Days, based on an ancient Tilbrook demo, is a grower and lives up to its title effortlessly. Open has a gospel chorus which beguilingly invites us to “Open your heart\ To this celebration” and that’s exactly what this record feels like – a celebration of life. Only 15 has a bluesy piano (Stephen Large is so good on this) and the beat of Top of the Form has been transformed from the break-neck ska of the demo version into a very funky mamb-esque rhythm (Simon Hanson is so good on this). Then there’s the classical string arrangement of Sunny, the country and western tinge of pedal steel guitars on Haywire, the Telstar-like Celeste of Honeytrap – it’s all a bit gob-smacking really. How is it Glenn Tilbrook can write melodies – and sing them – as well now as he did twenty, thirty, forty years ago? How is it that Chris Difford can come up with lyrics at this late stage that are as good or better than any he’s ever written? How can the band bring so many different musics to the mix and it all just sounds like Squeeze? Make no mistake this is a very very good album – surely up there with the best of their mature work -Frank, Play, Some Fantastic Place and Ridiculous. Ultimately it’s a happy, life-affirming album, full of joyful tunes and shot through with nostalgic memories of childhood and adolescence and love for family and friends made by evidently happy men who have made peace with life (and each other – hurrah!). Chris and Glenn both seem to be at a place in their lives where they can look back with a lot of love and understanding at where they came from. It’s a place recognised by many of the fans that grew up with them and are now, like them, deep into middle age. The beauty of it all is that though they’re writing and singing about their own past, it’s one that we’ve all lived in one way or another. Thanks Stuart – it was fun to write, though I forgot to mention the spine-tingling moment I first heard the penultimate track, Everything. What a beautiful song! And I should have mentioned Glenn’s wonderful guitar work. I could go on and on about it all! What shines through is that they all seem to have had a great time making this album.